Multiple Document Discounts: Prices of £259.00, £229.00, £209.00 and £199.00 are available when you order 1, 2, 5 and 10 items or more of this service. 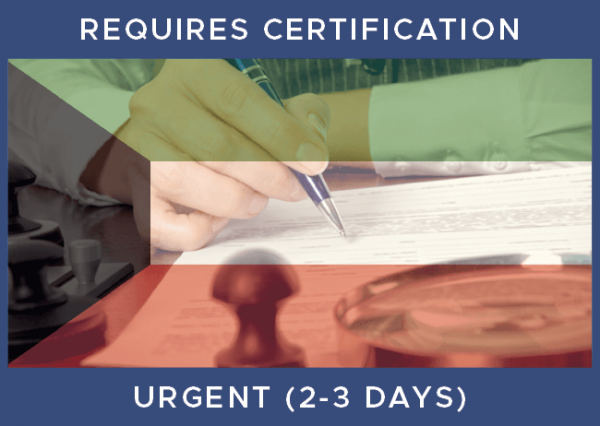 Choose this service to have a UK or Irish document legalised for Kuwait which does require certification beforehand by a solicitor or notary public. This is our urgent 2-3 day service. This service includes all the necessary steps needed to present a UK document to any of the Kuwait authorities, including the legalisation stamp at the Kuwait Embassy in London. If you have a particularly urgent requirement, you are welcome to drop off and/or collect your document(s) at our London processing centre. Details of how to find us can be found within our Contact Us section.